Differences over Zimbabwe's stalled power-sharing deal have dominated the first day of a summit of southern African nations in Johannesburg. Zimbabwe's President Robert Mugabe and opposition leader Morgan Tsvangirai are at the meeting, which is being chaired by South African President Thabo Mbeki. 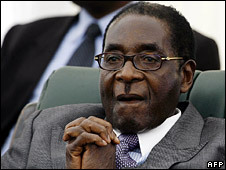 Botswana boycotted the event in protest at Mr Mugabe's presence. 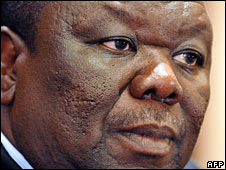 Meanwhile, details have emerged of a speech by Mr Tsvangirai, in which he says he would accept the role of PM. The Associated Press news agency said it had obtained a leaked copy of the speech given to regional cabinet ministers on the eve of the Southern African Development Community (Sadc) summit. In his proposal for resolving the contentious issue of who would lead any unity government, Mr Tsvangirai said he would accept the post of prime minister, and concede the presidency - and command of the military - to Mr Mugabe. The details of the speech could not be independently confirmed. Opening the two-day summit, Mr Mbeki, who has been mediating the Zimbabwe talks, said he hoped Zimbabwe's rival leaders would clinch a deal in Johannesburg. "This summit affords us the possibility to assist the Zimbabwean parties to finalise their negotiations so that together they can engage the work to achieve national healing and reconciliation," Mr Mbeki said. "I'm certain that the millions of Zimbabweans, both inside and outside Zimbabwe, await with great expectations and high hopes a positive outcome from our deliberations." Before the meeting, Mr Mbeki held talks separately with Mr Mugabe, Mr Tsvangirai, leader of the Movement for Democratic Change (MDC), and Arthur Mutambara, head of a breakaway MDC faction. A spokesman for the Zimbabwean president, Patrick Chinamasa, said negotiations would resume on the margins of the summit. Meanwhile, Botswana's President Seretse Khama Ian Khama refused to attend because of Mr Mugabe's presence. Botswana said it did not want Sadc to give legitimacy to the widely condemned second round of Zimbabwe's presidential election, in which Mr Mugabe was the only candidate. Sadc's executive secretary said he respected Botswana's decision, but insisted the remaining 13 members could still make binding decisions. The BBC's Jonah Fisher in Johannesburg says Zimbabwe's problems have spilled far beyond its borders, so fears that Sadc leaders have about its economic freefall and political deadlock are much more than just neighbourly concern. There are many who think Mr Mbeki, who continues to pursue a policy of "quiet diplomacy", has not pushed his Zimbabwean counterpart hard enough, our correspondent says. South Africa's trade unions, Cosatu, held a march in protest at Mr Mugabe's participation. Sadc leaders are also discussing efforts to fight poverty through regional development and cross-border co-operation, with a free-trade agreement expected to be announced on Sunday. Mr Mbeki said the power-sharing talks in Harare were adjourned on Tuesday to allow Mr Tsvangirai time for reflection. Mr Mbeki denied that there was a breakdown in negotiations after reports that Mr Mutambara had signed a separate deal with Mr Mugabe. Mr Tsvangirai warned that "a resolution that represents anything other than the will of the Zimbabwean people would be a disaster for our country". Mr Mbeki has said he is determined to reach a deal and has promised to stay in Zimbabwe for six months to get one if necessary. The MDC leader finished ahead of Mr Mugabe in the first round of the presidential election in March and the party also won a majority in parliamentary elections. But Mr Tsvangirai pulled out of the second round of the presidential election, citing a campaign of violence against his supporters.